Diverse in culture and abundant in natural beauty, Miami is a paradise for travelers seeking authentic experiences. With that in mind, Acqualina Resort & Spa is delighted to debut Acqua Experiences, a collection of highly curated lifestyle offerings available at the resort and around Miami with options for families, couples and solo travelers. Whether your preference is exploring the city’s world-renowned culinary scene or delving into nature, guests of Acqualina will discover South Florida with one-of-a-kind Acqua Experiences. Surrounded by sun, sand, and sea on Acqualina’s front lawn, guests will unleash their creativity during a painting class led by Miami artist Haena Chen Biton of Painting Picnik. In this free-flowing, abstract painting lesson, Haena will guide guests in painting what you feel and not what you are told. Influenced by nature – and Haena’s meditation techniques – participants will depart with a beautiful keepsake to remember their time in South Florida and at Acqualina. Cost is $35 per person. The class is offered every Sunday from 10am to 11:30am. Lounging on a yacht with a glass of rosé or diving beneath the Atlantic in search of marine life, Miami is the perfect place to spend a day on the water. Captain Matt of The Charter Agency has arranged for a private three-hour cruise exclusively for guests of Acqualina. Captain Matt will drop anchor at a popular sandbar so guests and their friends and family can swim, snorkel, or jump on a paddleboard and paddle around the sandbar. It’s recommended to keep cameras close as guests will likely see a variety of dolphins, turtles, and local wildlife. The Yacht Cruise is offered every Monday and lasts three hours. Cost is $180 for adults and $150 for children under 12. For guests feeling adventurous and looking to take the scenic route through Florida’s largest urban park, Acqualina invites adventure seekers to partake in a private kayak tour of Oleta River State Park led by Lauren, one of the park’s expert lead guides. The journey will begin as guests paddle through the mangroves and head into the calm blue waters of Biscayne Bay. Along the way, Lauren will share interesting facts about Florida’s ecosystem. Upon arrival to Sandspur Island, an hour’s paddle ride away, guests can swim, relax, and enjoy a light snack. From there, kayakers will paddle through a beautiful mangrove creek before returning to the Outdoor Center. The private kayak tour is offered daily starting at 10am. Cost is $45 for adults and $20 for children 12 and under. Certified PADI instructors Alejandro and Dara from Squalo Divers, a PADI Five Star Dive operation, will take water enthusiasts on a fantastic scuba experience and introduce an amazingly plentiful marine world in the warm, pristine waters of South Florida. 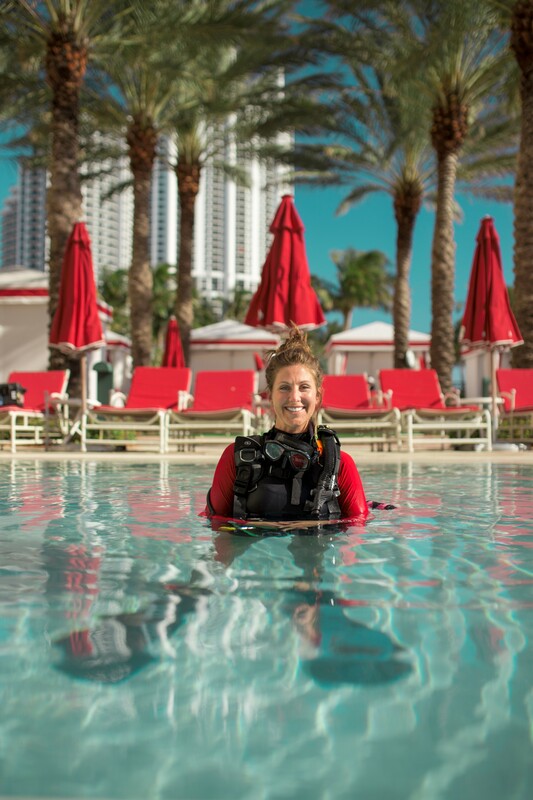 Guests can choose from three distinctive scuba programs which all begin with a pool session at Acqualina Resort. Children 8 and older can participate in the Discover Scuba experience, which takes place in the hotel’s pool where they will get an introduction to some of the fundamental skills of scuba diving. Costs range from $99 for a pool session to $599 for PADI certification. Cutting-edge fashion abounds in Miami, where the streets are filled with designer boutiques and the beaches play host to waves of stylish sunbathers. For eye-catching coastal style, Amanda Gutierrez is on hand to help guests find the perfect beach look. Meet the distinguished Miami stylist at the boutique at Acqualina Spa by ESPA to choose the ideal swimsuit, cover-up, and accessories – then step outside and onto 400 feet of pristine shoreline. Available by appointment only and must be booked 48 hours in advance. Although many Acqua Experiences are suitable for children, some are designed especially with young visitors in mind. For a memorable experience for the entire family, join expert animal trainers in Wildlife at Acqualina to interact with an array of exotic animals. Children will learn interesting facts about the animals and have the opportunity to take photos together. Available on select dates each month at Acqualina and lasts one hour. Young athletes of all ages will enjoy sports lessons in soccer, football, basketball, volleyball, and agility either through private lessons or group lessons with Oscar from Miami Fitness. Oscar has been helping kids achieve their fitness goals and teaching them all about the world of sports for over two decades and has been with Acqualina for a decade. Available by appointment only, lessons are priced from $100 per hour. Acqualina is delighted to partner with Stacey Mirander from The Etiquette Consultants to offer hands-on classes for children where they will learn the necessary skills and self-confidence to create a healthy character with classes focused on first impressions and valuable dining skills. Offered every Wednesday from 4:30pm to 5:30pm at Acqualina, cost is $30 per child. Healthy living is a way of life in Miami, and RedBike spin studio was born, bred, and inspired by the culture of the city – with classes ranging from the all-Latin RumbaRide to the daily synchronized club lights and beats reminiscent of a night out in South Beach. Join Acqualina’s dynamic CEO Deborah Yager Fleming at the RedBike studio in Aventura for Spinning with the CEO, a complimentary 45-minute class led by instructor Lyndsay. Full of positive and uplifting music, the cardio experience is high-intensity and rhythm-based for a fun, full-body workout. The complimentary class is offered every Thursday at 6pm. Miami “Photobiographer” Pipe Yanguas will capture the special memories and beautiful moments of guests staying at Acqualina Resort. Pipe will use whatever moves the heart or drives their life as the theme for the photo shoot. He uses natural lighting and the photo shoot setting will be selected according to the guests’ preferences. Available by appointment only and must be booked 48 hours in advance. To complement Acqualina’s innovative Bedside Reading™ in partnership with Madison & Mulholland™, where guests receive complimentary best sellers in their room every month, the luxury resort is offering story time for children with readings from some of the newest and most popular children’s books. Story Hour is held on select dates every month and children will receive the books to take home. From the crème de la crème of Miami’s culinary scene to the best in globally inspired street food, guests will discover the diverse flavors of The Magic City with Miami food writer Jenny Agress. South Beach, Wynwood, Little Havana, and Miami Beach are just a few of the neighborhoods on the itinerary. In the Top Chefs Tour, taste dishes from nationally acclaimed chefs – each recognized by the James Beard Foundation – and innovative cocktails in four of the city’s highest-rated restaurants. The Miami Cuban Food Tour offers insight into the city’s Cuban culture as only the locals know it, while the Miami Street Food Tour highlights delectable Venezuelan arepas, Mexican tacos, Cuban sandwiches, and more. Each tour lasts up to 4 hours with a maximum of four guests per tour and includes ground transportation and food and drink samples at each location. Reservations must be made two weeks in advance. For more information or reservations, please visit acqualinaresort.com or call 877.804.5723.